I don’t know about you – but I’m ready for fall. Here in our little corner of the Midwest, the weather can’t make up it’s mind. It’ll be in the 50s on day and the upper 70s the rest of the week. Since fall and winter are two of my favorite seasons (actually the only one I don’t like is the really hot part of summer), I’m always eager to get them here a little quicker. One of the ways I can do that is with a little squash soup. I’m pretty picky about my squash soup. I’ve had good squash soup, and I’ve had horrible squash soup. I typically like my squash with butter and brown sugar (not the best option for me), so I’ve been learning how to do it other ways. I’ve learned with the right seasonings and a little sour cream, the squash soup is pretty wonderful. I had to process a lot of pumpkin last fall, and after getting incredibly frustrated trying to peel it, my mom suggested a wonderful trick – bake it! I was in the process of canning the pumpkin, so I didn’t want it to be mush before I put it in the jars, but it doesn’t need long. About 10-15 minutes (depending on the size of the pumpkin) at 350 degrees F. All I did was wash them, cut them in half and stick them in the oven. The skin peeled off (just like when you dunk peaches in hot water) and the seeds came out easily too. It’s the perfect way to make anything with pumpkin and squash when you need to peel it. When it comes to this soup, the easiest way to finish it off is with an immersion blender. However, since I don’t have one, I can assure you that a regular blender works just fine. 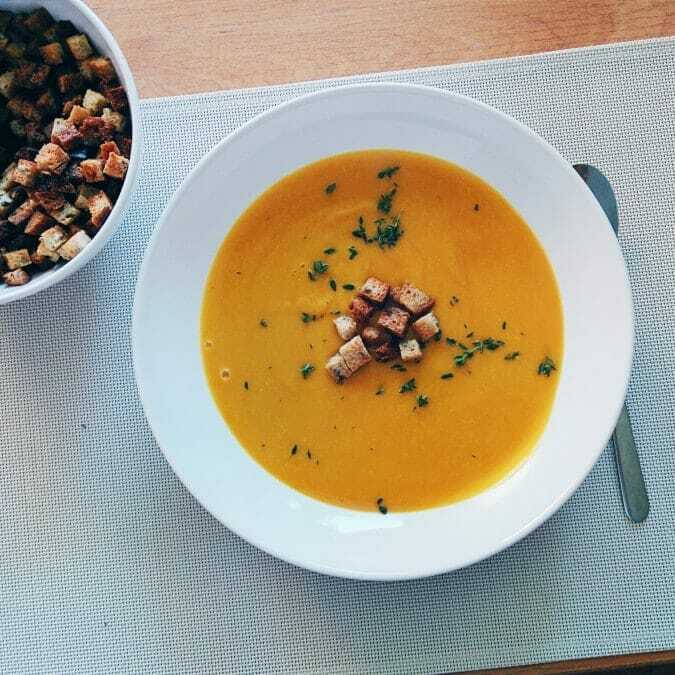 Simple and delicious squash soup cooked in a crock pot. A great way to have a cozy fall meal ready to go in the evening. Slice the squash in half. Place the squash directly on the oven rack, or on a baking sheet. Bake for 15 minutes, or until the skin is slightly loosened. Remove from the oven and allow it to cool for a few minutes. Meanwhile, sauté the onion in the olive oil for 3-4 minutes, or until tender. Add the brown sugar, ginger and garlic. Cook for another minute. Puree with an immersion blender, or use a regular blender (work in batches).